You’re here because you’re wondering how to choose the best soft tip darts. The perfect choice for your home or favorite drinking hole, soft tip darts offer all the benefits of a competitive game but take the danger out of the equation. So, with all the options on the market, which ones are the best? You’re not interested in flimsy, breakable models that won’t deliver awesome results. 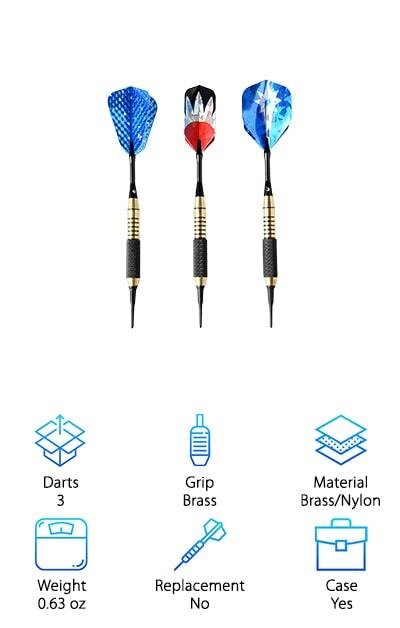 You want durable, professional darts. We had our experts research and review the best rated soft tips darts to bring you a top ten list of quality, affordable options. Let’s take a look at what to consider while shopping. Darts: The number of darts on hand can change the game from a match that involves keeping tally after each player throws, to tallying up after everyone has thrown all the darts on the board. Whether you’re looking to share a single set or want different sets to distinguish players, we’ll tell you how many darts come in each pack. Grip: When it comes to the world of darts, the grip on each model makes a huge difference. Everyone has their preference and yours is important, so you start each flight off right. This spec will tell you what each grip is made from, so you can find the perfect set for you. Material: Darts are manufactured in different materials, each of which offers its own set of benefits. Nickel looks nice and prevents tarnishing. Tungsten is heavy-duty and won’t break anytime soon. Check this spec for information about what the set you’re eyeing is made of. Weight: Weight is a major component to finding the right set of darts. The weight of the dart will determine the force needed during your throw to make it soar and hit the board exactly where you intend. Most soft tip darts weight between 16 and 20 grams. Check this spec for exact weights for each set. Replacement: Sometimes, dart tips break. It makes sense, considering the whole point of the game is to force your way into the bullseye! That’s why it’s always handy to have a few extra replacement tips, or even shafts, on hand. If your set comes with extra parts for emergencies, we’ll let you know. Case: A carrying case is the perfect accessory to a set of darts. It cuts down on the chances that you will lose or break a dart. Having a case is especially convenient if you plan to travel with your darts. Check this spec to see if your set comes with a case. Are you ready to start throwing darts like a professional? Now that you know what to look for, while shopping, it’s time to check out the exceptional options on our list! We’ve compiled all the best soft tips darts on the market for your browsing pleasure. Each set has been carefully considered before landing a spot as one of our top ten choices. If you’re in a hurry, check out our budget and top picks first. Let’s get shopping! The Billboard Evolution makes the list as our top pick, thanks to its convenient and awesome features! It comes as a set of twelve darts, with three in each of four flight colors: red, green, blue, and black. The distinct colors help you keep the game interesting and competitive, by allowing each player his or her own distinguished set of darts. Made from brass and featuring a lined metal grip, each tip is a standard 2BA soft design, measuring 1 ¼ " in total length. Individually, these best selling soft tip darts weigh 16 grams, which is the standard, preferred weight for maximum throwing ability. But, wait! It gets even better! 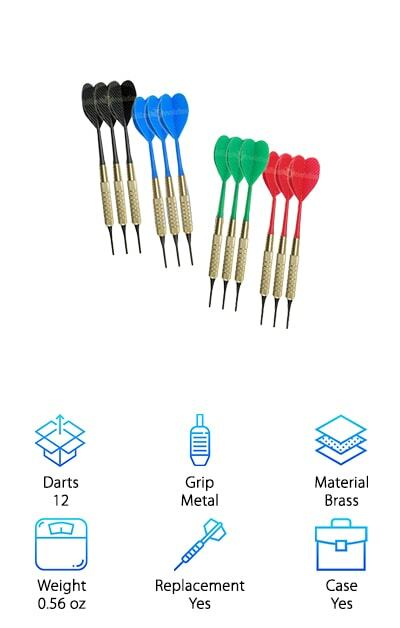 This set includes 100 black 2BA replacement dart tips, so you don’t have to worry about running out of options in the middle of a serious game. A helpful dart wrench for tightening and loosening tips from the barrels provides the ability to easily tighten the dart if it becomes loose during flight and playtime. Completing the set is a drawstring storage bag for stylish and easy travel and storage. Designed to strike with maximum precision, the Viper makes it easy for you to live up to its name during your next match! Our budget pick is made from high-quality nickel, brass, and aluminum pieces to provide strength and style. The nickel-plated barrels create exceptional balance and feature grooves under a rubberized sleeve for outstanding gripping points and hand placement. A convenient slim profile features diamond-cut aluminum shafts with tight locking holes that promote durability. That means you won’t need to tighten during a game as much as you would with other models! Stylish, well-made flights at the end of these darts reduce drag and help achieve top speed and accuracy. Even better, Viper is built tough, so you don’t have to worry about breaks. 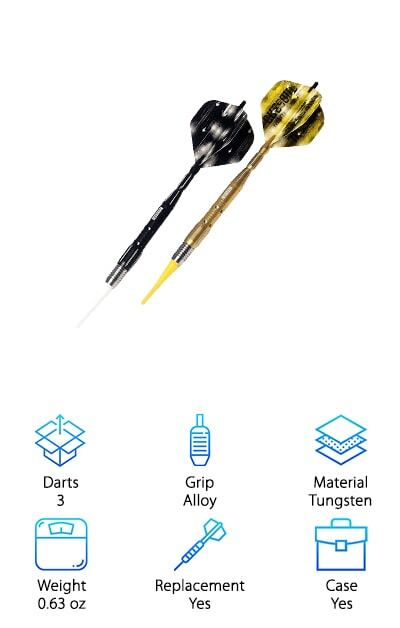 Each dart is equipped with a 2BA soft tip with a reinforced cone. We love this starter set and know you will, too. 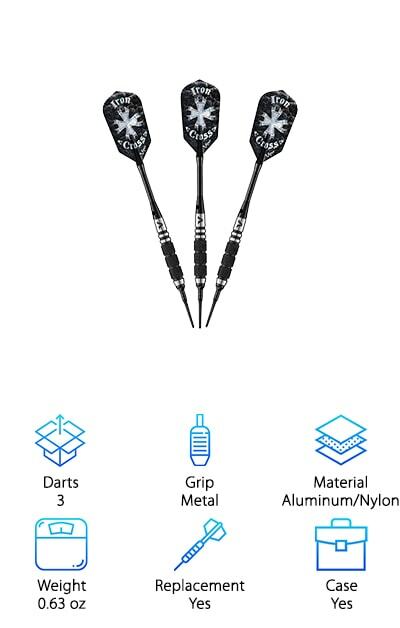 And thanks to its awesome affordability, we think Viper could easily be considered the best soft tip darts for beginners. Now you and your friends can play in style with the Vopa custom soft tips darts! 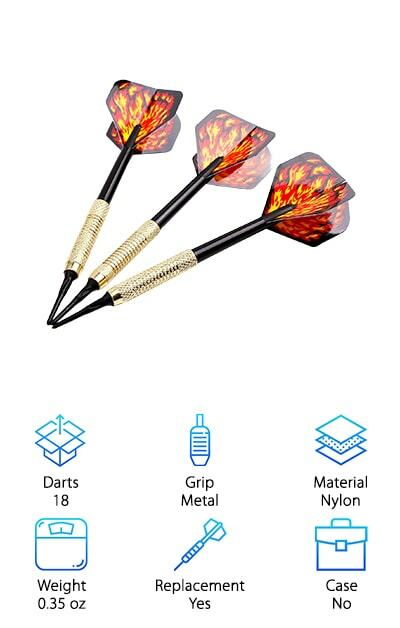 These colorful, professional darts are sold as a twelve pack. Made from high-quality aluminum and nickel-plated for extra protection, this set features four unique, interesting flight designs. 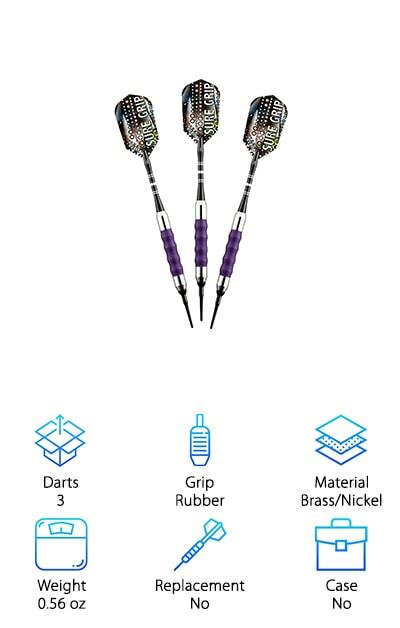 Each player gets their own set of three darts and the options are stellar. Choose from a yellow and black spider and web, red flames against a black backdrop, red, gray and black sloping stripes, and blue and white coordinating lines. And get this: this set comes with 24 plastic soft tip points to use as replacements. That’s two extra soft tips per dart, making this set last for quite some time and worth every penny. But if you’re not sold just yet, there’s more. Hundreds of tiny cuts create a unique gripping pattern along the metal shaft, resulting in perfect finger placement that is comfortable and results in maximum flight speed. A twelve month warranty make Vopa our pick for the best soft tips dart brand! If you’re looking for a complete set that offers the versatility of both soft tips and steel tips, then look no further! W.M. 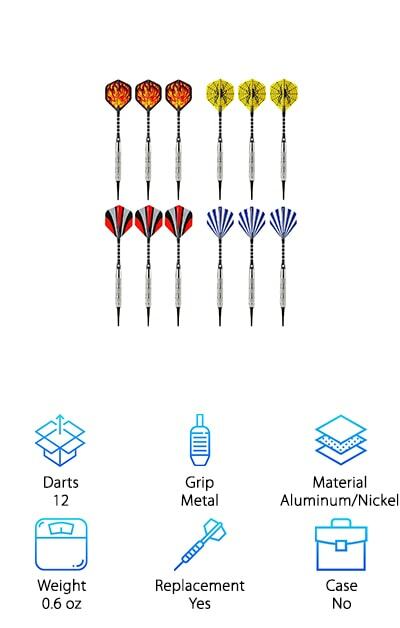 Darts Set came up during our search through all the best soft tip darts reviews as an exceptionally sturdy, quality item with a point converter. The point converter design allows for easy switching between soft tips and steel tips, making this W.M. an excellent choice for beginners looking to experience both kinds of play. 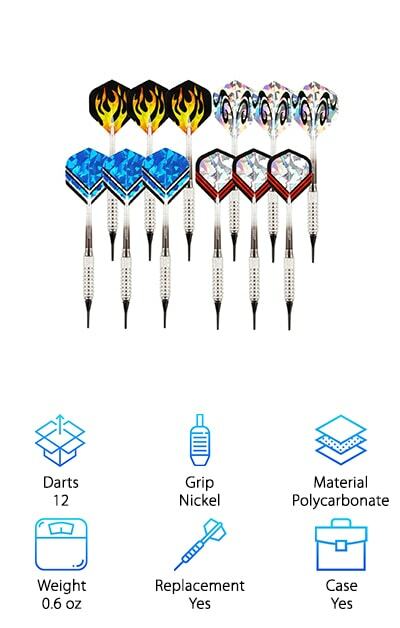 The set includes three darts with nylon shafts and grooved brass gripping points, as well as nine dart flights in different shapes, three steel tips, and three soft tips. Three extra shafts are included as replacements. An attractive hard case with a sturdy insert that offers separated spots for each piece, rounds out the set and lets you travel and store your darts in style. W.M. has everything you want if you’re looking for a classic, personalized, and versatile set of darts. Get the party started with Sanfeng ultra-durable, quality aluminum darts. Designed with a 20 gram, thick barrel and a deep-groove consistent grip, these darts are made to last. The black flights decorated with shocks of electric green make for a stunning sight soaring through the air and match nicely with the green barrels and uniquely shaped black grips.The 2BA screw thread soft tips are made to last and durable. The locking holes make it so your darts won’t come apart during flight and the overall design helps you hit the target. Better yet, the set comes with extra white shafts for replacement, a convenient black portable case, and a two-year year warranty. This professional-grade set is not the most expensive soft tip darts, but they perform just as well. Super affordable, you will be pleasantly surprised by just how much these darts deliver on a budget. Wow your guests with Fat Cat Darts in a Jar. This set of 21 darts comes in a handy twist-top jar perfect for storage and travel. The number of darts included means more players can join the fun, making it a party to remember! It also ensures that, if a dart ever breaks, you have plenty extra. Made with high quality, nickel-silver plated barrels and strategically-placed knurled bands with deep grooves and rings for maximum grip, Fat Cat soars through the air with precision to hit your target. The nylon shafts provide a tight fitting to the barrel that improves stability and greatly reduces the need to retighten during play. And you’ll get a kick out of the red cat in a fedora hat design on each flight! Weighing .60 oz (17 grams) each, these darts are perfect for beginner and intermediate players alike. You won’t want to miss out on these if you’re looking for a large set. Super slim and flexible, MAXMAU makes a set of darts perfect for any electronic dart board. These soft tip darts come in a pack of 18, with six sets of darts featuring three each in different, colorful flights. A skid-proof knurling dart barrel, nylon shaft, and standard 2BA screw thread soft tip come together to make each dart perfect for a competitive game. Grooved grips provide space for optimum finger placement and balance while throwing, so you can be at the top of your game! The lightweight design is great for players who prefer to throw fast. 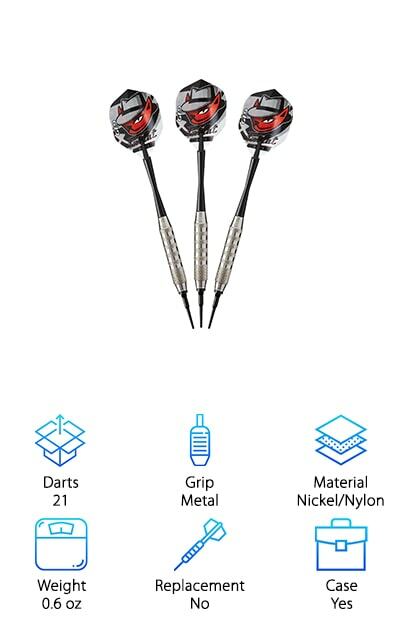 If you love to host events and you want a dart set that allows for multiple players to show off their skills, MAXMAU is the perfect addition to your party supplies. Even better, the durable design allows for extended use, so you can be comfortable breaking out these darts for practice as much as you want! If you’re looking for the best plastic tip darts, you’re in the right place! Made from 80 percent tungsten and 20 percent nickel barrels for a slim design that allows tighter grouping on the board, the Viper Desperado boasts rave reviews and is loved by dart enthusiasts! Its knurled bands and deep grooves offer exceptional grip for perfect hand placement during throwing. The aluminum shafts are equipped with locking holes that improve stability. And an extra set of nylon shafts are included as a bonus! Three extra flights, seven additional 2BA dart tips, and a dart mechanic wrench round out the set, so you have everything you need. Best of all, you can easily get organized and travel in style, thanks to the two-tone black and chrome aluminum case, complete with a soft cloth lining inside. Perfect for the dart player in your life, this classy set has everything and more. The best soft tip darts provide exceptional balance and unbreakable shafts, just like ARIZZ! Made from polycarbonate, the shafts on ARIZZ darts are ultra-durable, so they last for a long time. When you invest in a great set of darts, you want to be sure they aren’t flimsy. The nickel-plated, grooved steel barrel shells promote proper finger placement and precise aim. As a set of 12, these darts come in four different unique, colorful flight designs, all of which are removable. The laser design on the flights results in a shiny, attractive sight soaring through the air.Twelve extra flights and barrels keep you stocked and playing and 24 extra 2BA soft tips keep the party going, even if a tip breaks. Store your set in the convenient jar that comes with your purchase, so you never lose any of the precious pieces. Easy to carry, you can also bring it all with you, wherever you go! If you’ve been asking yourself who makes the best soft tip darts, then we have the answer for you. Rounding out our list are the exceptional CUESOUL Armour Soft Tip Darts. 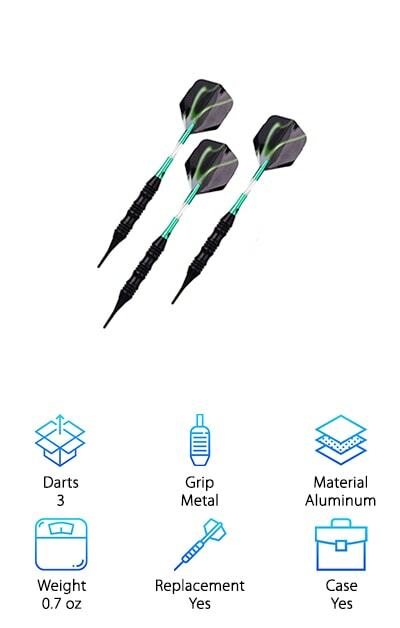 Sold as a set of three, these durable tungsten and alloy darts come with three cores, six exclusive flights, and six matte finished shells in a range of colors. Six soft tips complete the set, so you have a replacement for each dart. The one-piece barrel and shaft design allows you to switch out shells, so you can play with different colors to suit your mood. The carefully-lined alloy grips encourage optimum finger placement, creating a stable flight track every time you throw. If you want to impress your friends during your next game, show up with the CUESOUL and you are sure to have the best-looking, professional darts in the bunch! The beautiful travel case makes for a great companion and fits the whole set nicely.